The nervous system of an animal can be studied by cutting it up into thin layers—however this inevitably leads to the destruction of the cellular structures in the tissue. Analyzing complex nerve connections is then hardly possible. The far more elegant method is the so called optical "clearing" of the various tissues using chemical processes that make the animal transparent. Interesting structures in the tissue may then be selectively marked and analyzed. At the Vienna University of Technology, a clearing method has now been developed that can be applied to insects, which is a particularly difficult task. With an improved light-sheet microscope (a so-called ultramicroscope), it is now possible to image large nerve tissue samples and take high-resolution pictures of complex neural networks that have been labeled with fluorescent molecules. The new method has been published in the journal Nature Communications. "We can learn a lot about the nervous systems of animals by using genetic engineering to insert special molecules into the nerve tissues, which can then be made to fluoresce," says Marko Pende, a Ph.D. student at TU Wien (Vienna). The big question is how these fluorescent molecules can be imaged without damaging the tissue. One method that has been used with great success is ultramicroscopy. Transparent tissue is illuminated with a laser beam, which is widened by special optical elements, creating a two-dimensional flat surface of light. This surface penetrates the tissue and illuminates those fluorescent molecules that lie exactly in that plane. Layer by layer, the tissue can be analyzed with this light-sheet, creating a three-dimensional model from the two-dimensional frames on the computer. "We focused on the fruit fly drosophila melanogaster because it is of particular interest for research into the nervous system. Unfortunately, it is particularly difficult to develop a suitable clearing method for insects, "explains Marko Pende. "For the tissue to become transparent, it has to be treated with special chemicals, and in insect tissues these chemicals have always destroyed the fluorescent molecules until now." In addition, insect tissue contains chitin, which can hardly be made transparent. Also, drosophila has particularly robust pigments in it its eyes. 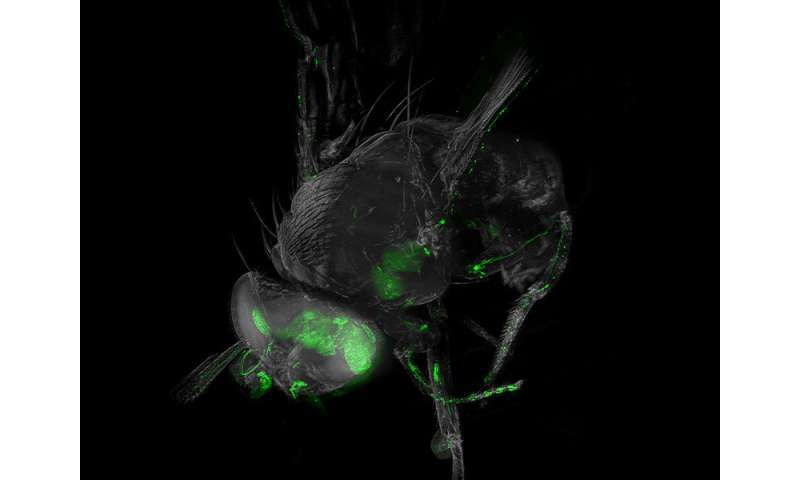 The team at TU Wien (Vienna), together with the University of Vienna and the Medical University, succeeded in finding a way to make drosophila flies completely transparent without destroying the fluorescent marker molecules. This was achieved with the help of improved chemical mixtures. "It is an important step forward for the drosophila research community," says Prof. Thomas Hummel from the Department of Neurobiology (University of Vienna). The pictures were made possible by pioneering optical research by Saiedeh Saghafi (TU Wien). She was able to significantly improve the ultramicroscope: The light-sheet, with which the plane is illuminated layer by layer, used to be about 10 microns thick. The improved ultramicroscope now produces uniform light-sheets of only 3 μm thickness over a large area. In addition, the microscope was equipped with an additional lens, which changes the focal point, much like to a pair of glasses: "So far, we could only focus on the outer area of the tissue, now we can take a centimeter-deep look into the tissue and still get sharp images," says Prof. Hans Ulrich Dodt, Head of the Department of Bioelectronics (TU Wien). 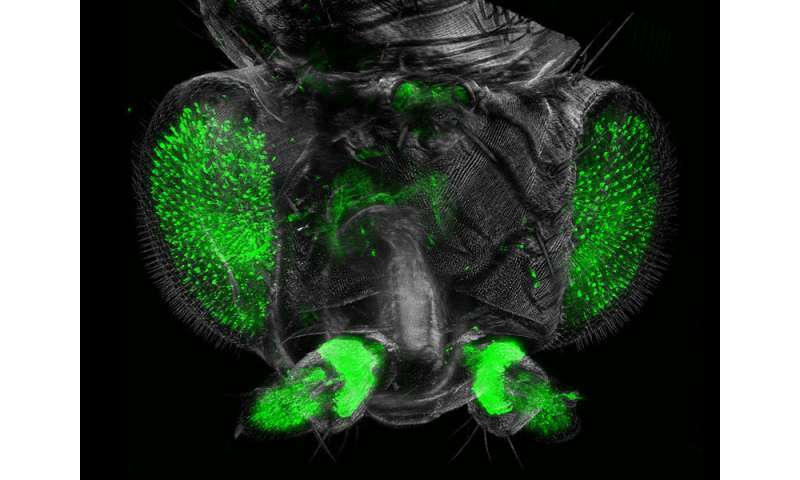 "It will enable impressive, high-resolution images that will give us important insights into the way the Drosophila nervous system works." The new technique should now help to study the so-called connectome of drosophila. The connectome is the arrangement of interconnections throughout the nervous system, the "electrical circuit diagram" of the animal. This circuit diagram can then be related to behavioral patterns of drosophila. In addition, drosophila is ideal for analyzing genes that lead to neurodegenerative diseases in humans, such as Alzheimer's and Parkinson's disease. Transparent flies now provide a unique opportunity to understand the complex changes in various areas of the nervous system during neurodegeneration.